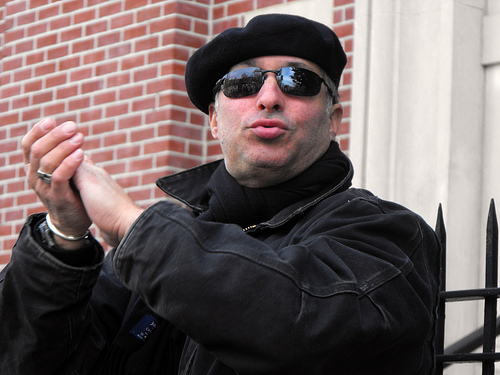 Bundled up in a scarf, jacket and black beret Christopher Neal Rommelmann, 50 of Brooklyn Heights, took the job of cheering on runners in the NYC City Marathon pretty seriously. He’s run 20 marathons all over the world, but a recent injury sidelined him today. According to Rommelmann, the hardest part of the race is the beginning, but the end result is very rewarding. Rommelmann said this year’s run is special because of the recent memories of the Boston Marathon bombing. The NYPD beefed up security for the race this year after the Boston Marathon bombing last April that killed three people and injured over 250 . 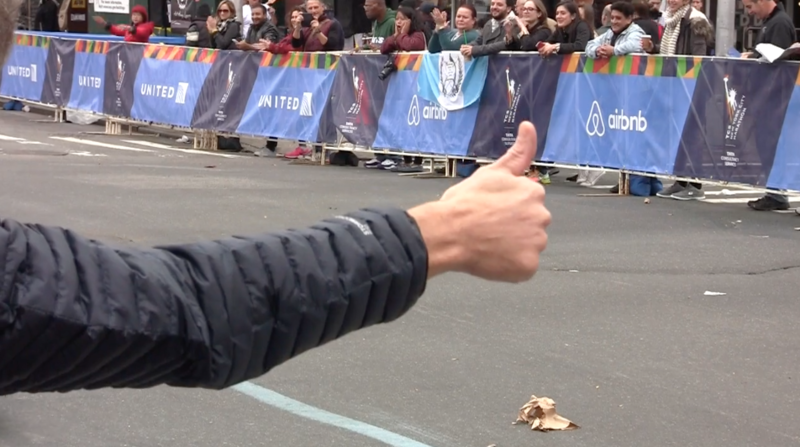 Police used baggage screenings, helicopters, surveillance cameras and bomb-sniffing dogs to make sure the 26-mile race that featured more than 47,000 runners went smoothly. 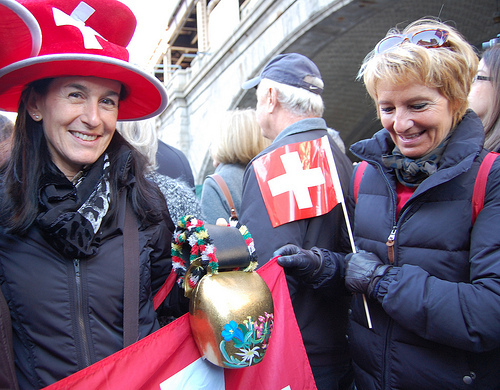 Rommelmann said for people watching, the marathon is an experience that should not be missed. “You gotta bundle up a little bit, but it’s so worth it,” he said. The screams of “Aussie, Aussie, Aussie!” from Jennifer Henry aren’t hard to hear even over the band, the voices of the crowd and the runners’ footsteps hitting the ground one by one. Henry, 46, has been a resident of Park Slope for five years, but it’s clear she hasn’t forgotten where she is from. 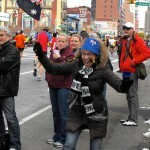 Decked out in an Australian hat and holding high her home country’s flag, Henry said one of the reasons she comes to watch the New York City Marathon is to support her compatriots. 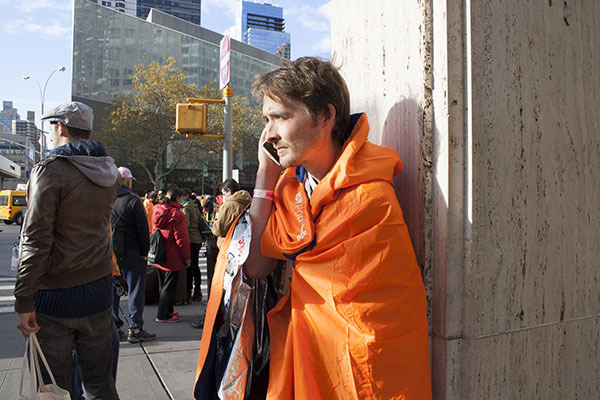 It wasn’t hard for runners to spot or hear Henry. 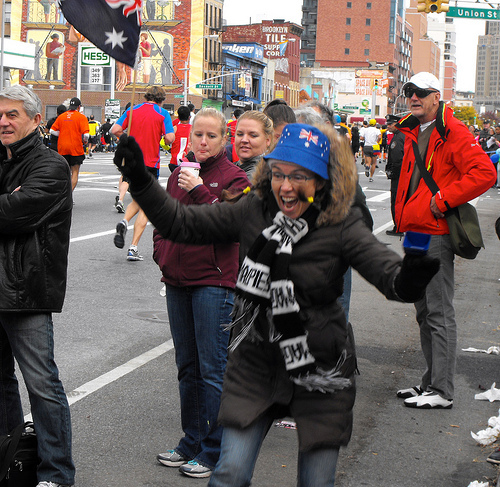 As one runner passed, she joined him for a few strides down the street and let him knew loudly there was another Australian in the crowd. Henry, who works for a scientific non-profit and came to the United States because of her job, said she has never run the race, but the joy for her is watching those people who might be running their first or last marathon. She was referring to those runners in the race who might have or are overcoming injuries. Henry said she had not missed a race since she moved to the States and is motivated by wanting to help those runners that need more support. “Makes me feel good,” she said.